Living in Mooresville has lots of advantages and Carey and I just love it, especially the weather; it is so nice here almost every day! Summer brings the occasional thunder storm and hail, fall has the opportunity for the occasional hurricane up the east coast and winter has ice storms. Unlike the northern states where it snows like crazy, we get ice and sometimes for numerous days. 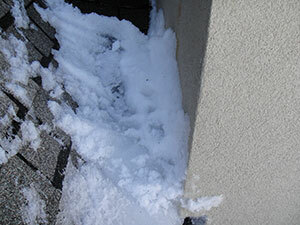 Ice can damage an older roof and cause leaks that will cause expensive repairs. Don’t wait until your ceiling shows a leak, if your roof is over 10 years old have Carey inspect it for free. Remember: An ounce of prevention is worth a pound of cure!